The Democratic National Convention’s brilliant plan of “act like a business for people who are getting owned by business” is proceeding just as planned. The DNC, taking a page from the dark mirror universe version of How To Do Politics, is sending out mail that looks nothing like student debt collectors shaking down graduates for their spare change. Surely, this will win the hearts of millennials. “Empty promises.” Why would the Dems be taking Trump to task for not building the wall? They are doing what they have been doing for the last forty years: stretching the base as far as they can while not going left at all. The Donkeys scolding Trump for not building the wall only makes sense if they are hunting disaffected conservatives. The Democratic National Committee has a problem. Its job is primarily to raise money, and to continue to exist. Everything else is disposable, including policy and people. The reason the corporate Dems are reluctant to go left is because they are terrified their big donors will leave them. Given a choice, they will always, always punch their progressive ring to appease their bankrollers. It doesn’t matter how many times you tell the Dems that the centrist Republican voters they are hunting don’t exist—they will Ahab after them forever. Ask the Dem leadership why they engage in this kind of behavior—extortion and elephant-flirting—and the excuses are always preposterously lame: “Oh, we have to—the other guy will win if we don’t.” The unspoken truth is that politics of this kind is a business, and there will never be enough money for the Dems, or any other non-profit which operates under gala rules. Why do you think so much of charity revenue goes into additional fundraising? Twenty cents of every dollar given to Susan G. Komen is spent on administration and fundraising—that’s the same administration that decided to defund Planned Parenthood. The Dems are the same. They cannot claim to represent the working class any more than I could claim to represent vegan realtors. Why didn’t Pelosi and the rest of Team Donkey send out a letterhead titled “YOU ARE ON THE MENU, PLEBS”? It would have been more honest. It makes a kind of lunatic sense, this kind of mailing. The Dems are a collection agency. They garner the wages of idealists and do-gooders and sell them to Wall Street. The Dems are in hock to business and every other corporate Continental-brunch-haver worth naming. It’s easier to make a list of who the Dems aren’t owned by. We know they’re in bed with people who collect debts for a living. Why wouldn’t they pick up the tips ‘n’ tricks of their business partners? Live with someone long enough, and you begin to resemble your partner. You look at this mailing and see shamefulness, but I stare at it and see the synergy of business love. A romance novel written by Adam Smith. 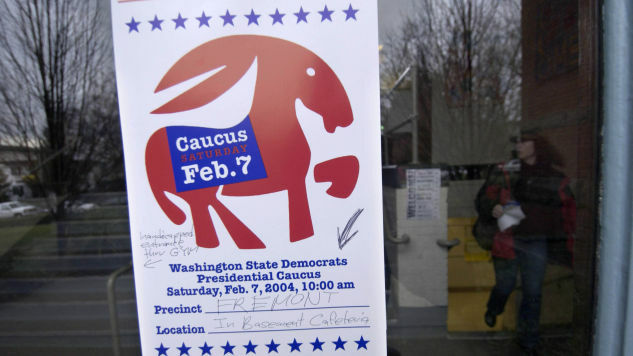 As Open Secrets reports, “Individuals and political action committees affiliated with the industry gave 57 percent of their 2008 cycle campaign contributions to Democratic candidates — the first time since the 1990 election cycle that Democrats had received a majority of the industry’s donations. Previously, this group had given Republicans the edge by margins of two- or three-to-one.” The Democrats are true to their word: they really are knocking down all kinds of barriers. It is possible to stand for absolutely nothing, except fundraising. When I was nineteen, I made the mistake of signing up for a Greenpeace mailing list. One day, I received a letter from them with a returnable postcard. The item had two checkboxes. One read “No, I Don’t Want to Help.” Fair enough, but the other box read “Yes, I want to stop rock-throwing pirates—and More!” That was an awakening—liberalism could scrounge a buck just as easily as the Francoists at National Review. Ever since that day, when I discovered the Bank Account Also Known As Greenpeace, I have wandered the Earth in a state of perpetual amazement, knowing that writing satire was the easiest conceivable human activity. I didn’t give Greenpeace any money—I may have insulted the whales to spite them, in fact—but I clipped that piece of paper and put it in a keepsake box. I have it still. This Democratic fundraising letter is from that same family: shameful, money-hunting hustlers pretending to be woke. But they can’t abide their own tactics. The public have been sending the Democrats FINAL NOTICES for a long time. The bill came due in November. We’ve given you a grace period, Dems. When will accounts be settled?